Huskies take shedding to a whole new level. Like most breeds bred for arctic conditions they don’t just shed, they ‘blow coat’ once or twice a year. They rapidly shed their thick winter coats for lighter coats for the warmer months. Putting our cleaning equipment to the test! As a Husky owner you will needto arm yourself with a high quality pet hair vacuum, a good broom and the best brush for a husky. And there is an upside to having a husky – apart from the fact they are wonderful, affectionate pets. Huskies are actually one of the few dog breeds that groom themselves by licking their coats. But they still need a little help from their human with brushing and trimming to remove knots. While it might be frustrating having hair everywhere, shedding is the best way for your pet to get rid of dead hair, allowing the new coat to grow naturally and to help them cope with the changing seasons. It might seem less of a hassle having a single-coated pooch that doesn’t shed as much as a husky, but those little-shedders need to be professionally groomed to avoid their coats becoming matted. And once you understand what’s required to properly groom a husky it is much easier to manage. There is a pattern to howa Husky blows coat. It usually starts on the legs, spreads all over the body and ends at the tail. The process can last anything between six to eight weeks, depending on how quickly the hair becomes loose. Also, constant grooming of the tail, haunches, and neck is important as these areas are prone to forming mats. It is possible to speed up the shedding process and keep your home as Husky hair-free as possible with daily brushing and a warm soak every now and then. As soon as you notice the first tuft of loose hair get a “greyhound” comb; you’ll recognize it by its distinctive look. It is made of stainless steel and has two sets of ‘teeth’ – the wide teeth untangle and loosen the hair while the closely spaced teeth are used to finish off the grooming session, leaving the coat shiny and smooth. 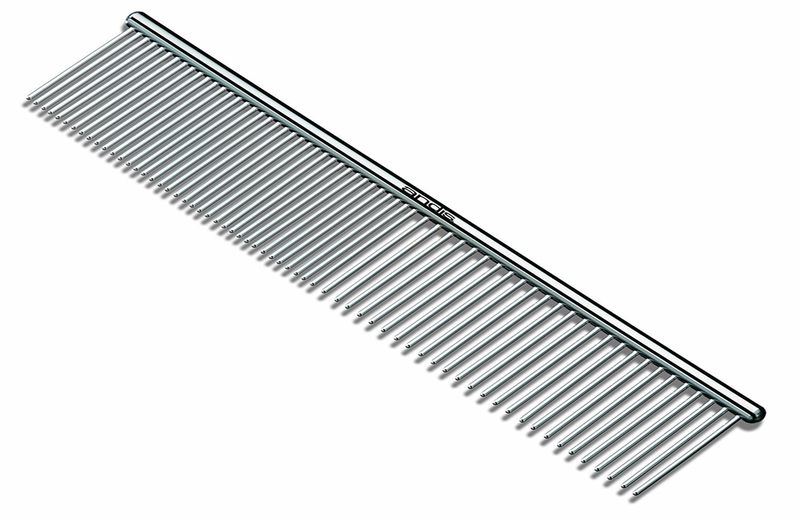 The comb has been designed in such a way that you can use it in any direction without hurting the dog or damaging its coat. An undercoat rake is also good as it reaches the denser part of the coat. It is designed to pull the loose undercoat through the guard hair, with very little effort and without hurting or damaging your Husky’s fur. As soon as you notice a knotted section or mat, untangle it bit by bit with a comb. Some Huskies’ coats form mats quicker than others; if your pet is prone to this it is a good idea to use a liquid and tangle remover as part of the grooming process. When you are ready to start grooming make sure your dog is on an elevated platform, that is stable and safe, for the both of you. This will stop your Husky trying to make a run for it and will be more comfortable for you. It is important to mention that the grooming process might take a little time, especially the first few times you do it. Don’t rush it, rather use it as bonding time with your best friend. Some dogs like a good old soak while others might equate it to being tortured, you’ll soon see which of the two you have.Regardless of how much your mutt time your mutt likes to spend in the water, regular bathing is essential to removing the loose, dead hair and it will keep your dog’s skin moisturized and clean. A tip from dog grooming experts is to only use special dog shampoo. The shampoos we use on our hair can lead to dried out skin and other skin irritations. Dog shampoos have all the essential oils and nutrients to keep you dog’s hair in ‘furpect’ condition. The good news is it’s not necessary to bathe your Husky more than twice a year. The best times are when you see your pet is shedding its undercoat, usually a round mid to late spring. You can also, in the hotter months, give them a cooling off with the hose or even with a quick dip in the pool. We have already mentioned that this particular breed is pretty good when it comes to personal hygiene, licking themselves, which serves as a way of removing loose hair, and it even keeps them smelling fresher than other breeds. However, for a well-groomed, healthy looking pet it is recommended that you use a pin brush several times a week, for about 15 minutes at a time, especially during shedding season. If your Husky doesn’t mind you can also use a dryer. It helps to find any sores or ticks in amongst all the fur. Should I Shave My Husky? This is one of the most frequently asked questions we receive from Husky owners. Should I shave my Husky? The answer is quite simple. No! While we think we’re doing our best friend a favor, keeping him cooler in the summer months, we’re actually removing his natural protection from the elements, like sunburn and insect bites. It also means your pet is unable to regulate its body temperature. The only time a Husky can be shaved is under the supervision of a vet, for medical reasons. The best thing you can do is make sure your pet has loads of shady spots, good ventilation and fresh water available throughout the day. No one said having a Husky was easy, but it’s definitely worth the effort. A lot of Husky owners I know spend a good part of their week grooming their pet, but it’s not a chore for them. It’s quality time spent together, just a human and their four-legged friends. Let’s take a look at each of the tools used for grooming your Husky. We’ve mentioned it before, and we’ll remind you again, regular brushing is essential for this breed and having the right equipment will make the entire process a whole lot easier. An undercoat rake isn’t a negotiable, it’s a must-have item when it comes to grooming your Husky. It allows you to get deep into the coat, removing the trapped dead skin and excess hair. Described as “the best grooming tool for your furry friend”, the Rubold Fur Perfection Professional Rake Brush is the answer to all your grooming questions. 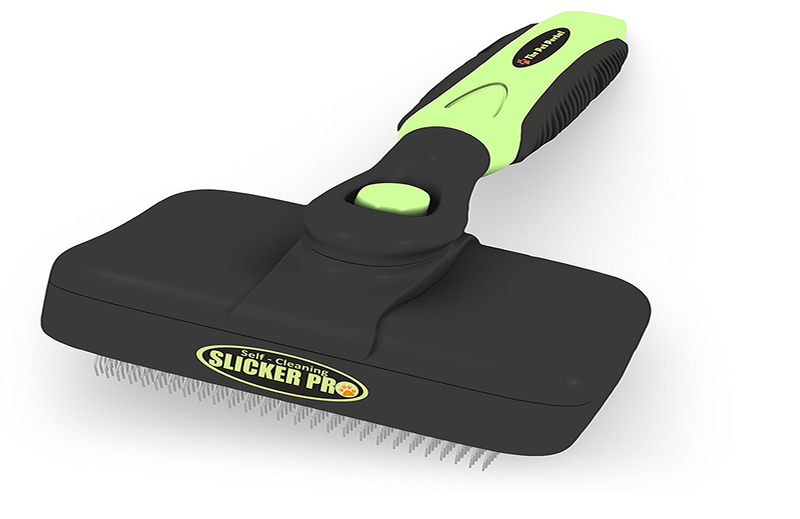 This is a professional quality pet grooming tool, used by groomers and pet ownersto get rid of mats and tangles. It also removes the hard-to-reach dead undercoat. 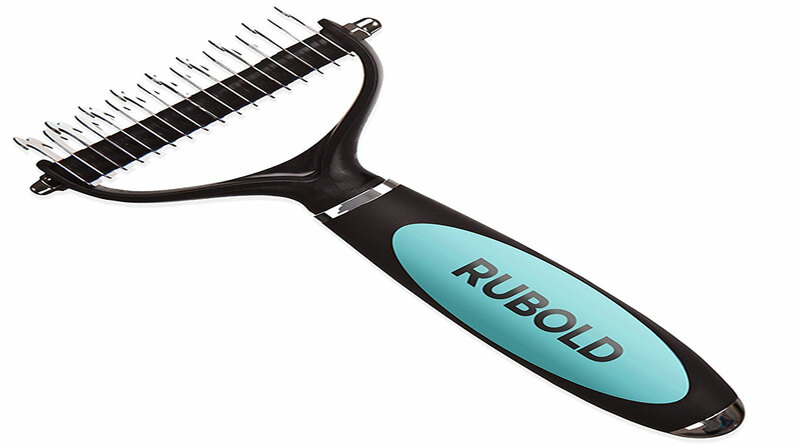 The Rubold Fur Perfection rake is gentle enough for everyday use because of the rounded edge teeth. The design stops the rake from irritating your dog’s skin and it doesn’t damage the fur. The FURminator Dog Rake is part of a line of quality grooming products and will allow you to achieve professional results at home, with minimum stress or fuss. Having been in the industry for years, FURminator understands the shedding process and has developed an entire range of products that help reduce shedding, leaving you and your pet happy. The FURminator Grooming Rake is a multi-functional tool and can be used before bathing your dog, to remove mats and knots. It also gets rid of loose hair from the undercoat and it separates the hair. It’s gentle enough to be used on the most sensitive of skins because of the rounded stainless steel teeth and the angle of the head of the brush. The greyhound comb is essential in your grooming kit as it gets all the mats you might have missed. It is also used as part of the last steps of the grooming process, leaving your dog’s coat shiny and smooth. Recommended by professional groomers and dedicated pet owners, the Andis Pet Steel Grooming Comb is a very popular choice as far as greyhound combs go. It is multi-functional, removing tangles, loose hair, mats, dirt while it stimulates the hair follicles and skin. Like all greyhound combs, it has fine and coarse teeth and it is perfect for finishing off the grooming process. The right slicker brush is a must-have item, especially for Huskies. 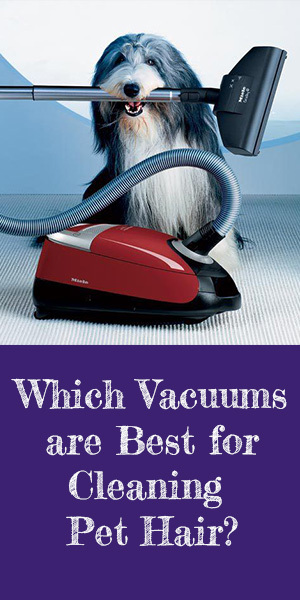 It effectively removes mats, tangles and excess loose fur, as well as dirt with the least amount of fuss. The Pet Portal Self Cleaning Slicker Brush with Retracting Bristles is recommended by professional groomers and for use at home. The soft and flexible bristles mean it’s gentle on your pet’s coat. What we really like is that it is self-cleaning. All you need to do is push the button, wipe it and it’s ready to use again. Available in small, medium and large, it comes with a free dog grooming e-book and has a 5-year manufacturer warranty. The pin brush is where it all started. The wooden pins delicately separate the tangled area from the rest of the coat. The pins loosen the tangle gently by drawing hairs up and away from the knot. The design of the brush and the wooden pins eliminate pulling and doesn’t damage your dog’s skin. There is no breaking the hair either with this particular brush. 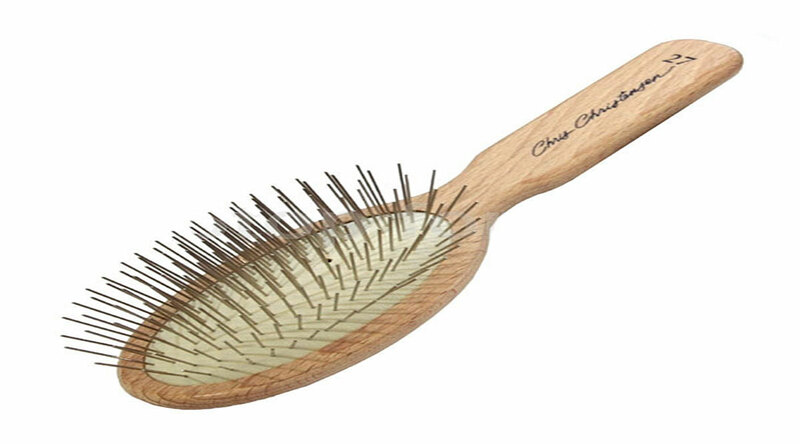 Pin brushes stimulate the hair follicles, which in turn produces natural oils. These oils give your pet’s coat a healthy shine and keep their skin free of dryness and associated irritations. The Chis Christensen Oval Pin Brush is the professional groomer’s go-to brush when it comes to Huskies. The brush, while not the cheapest on the market, gets all the loose fur, and doesn’t make the fur static. The popular pin brush is made of solid beech wood; it is durable and sturdy but still lightweight for comfortable grooming sessions. Designed and manufactured in Germany, the high-quality stainless steel pins have precise tips and allow for a neat finish. The oval pin brush is available in various sizes including 20mm, 27mm, and 35mm, depending on the size of your pet being groomed, or, if budget isn’t a huge issue, you can use the different sizes for different areas on your Husky. First things first, this dual-sided pin and bristle brush ismultitasking at its best. 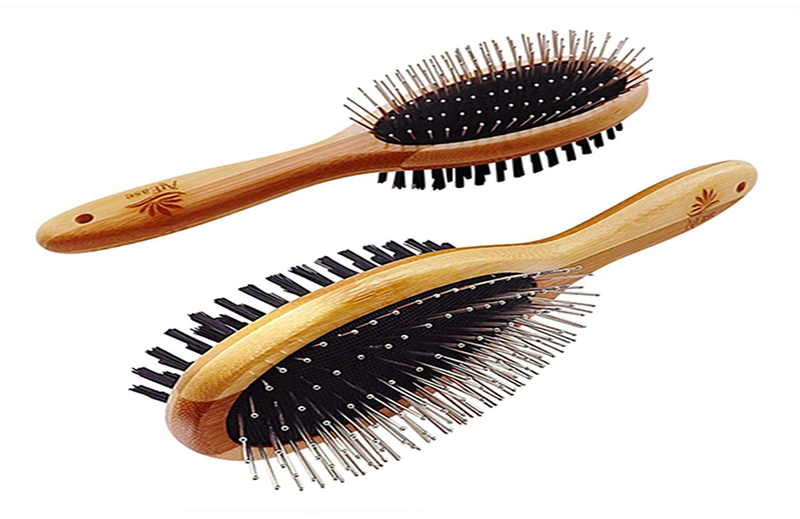 The natural bamboo eco-friendly dual-sided pin brush from AtEase Accents is made of natural bamboo and has two sides; the bristle brush demats and deshedsyour pet while the soft pin brushes stimulates the natural oils and blood flow, encouraging a healthy looking coat. 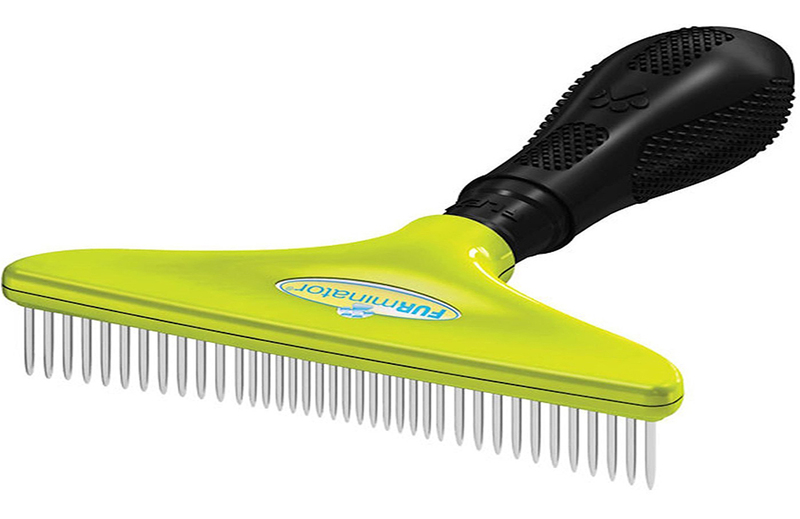 The eco-friendly brush removes dirt, prevents knots and tangles and keeps your pet’s fur irritant free. Starting off the grooming process with deshedding treatments can save time and a lot of frustration. Using shampoos and conditioners makes getting rid of the trapped hair and dirt quicker and easier. This is because of the omega oils in both treatments. Your dog will not only smell nice, because of the shampoo, he’ll also look like a million dollars because of the conditioner, with a shiny and healthy-looking coat. The deShedding Ultra Premium Shampoo from Furminator reduces shedding and promotes a healthy coat and skin. 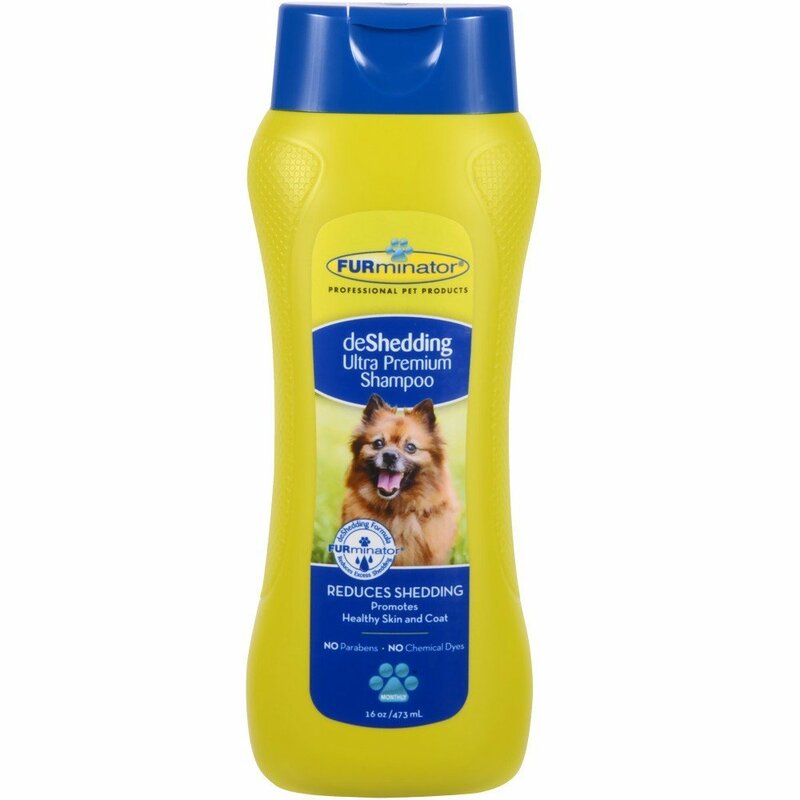 As the name suggests, this Ultra Premium shampoo doesn’t stop your dog from shedding, but what it does do is release a lot ofhair while you wash. The end result is less hair falling in and around the house in between washes and grooming sessions. We especially like the FURminator shampoo because there are no chemical dyes or parabens. It is enriched with Calendula Extract, Omega 3 and 6 fatty acids, and Papaya Leaf Extract. It also has extracts of Malva Flower, Blueberry, Aloe Vera and Kava Vitamin E. There are no parabens, artificial colors or chemical dyes and. The best results are achieved when you use the shampoo (and conditioner) as part of the grooming process on a monthly basis. The FURmintaor deshedding conditioner reduces excess hair loss in between monthly grooming sessions by getting rid of more of the undercoat during the bath. As with the shampoo, there are no chemicals or parabens and the formula is enriched with Omega 3 and 6 fatty acids, Aloe Vera and Chamomile Extract. While you might notice more hair falling out within the first 24 hours of using the conditioner, this lessens over time. The shampoo and conditioner, together with a good brush, will most definitely reduce the amount of excess hair on your clothing and furniture. To save time and increase productivity, professional groomers often have dryers in their salons to remove loose hair. 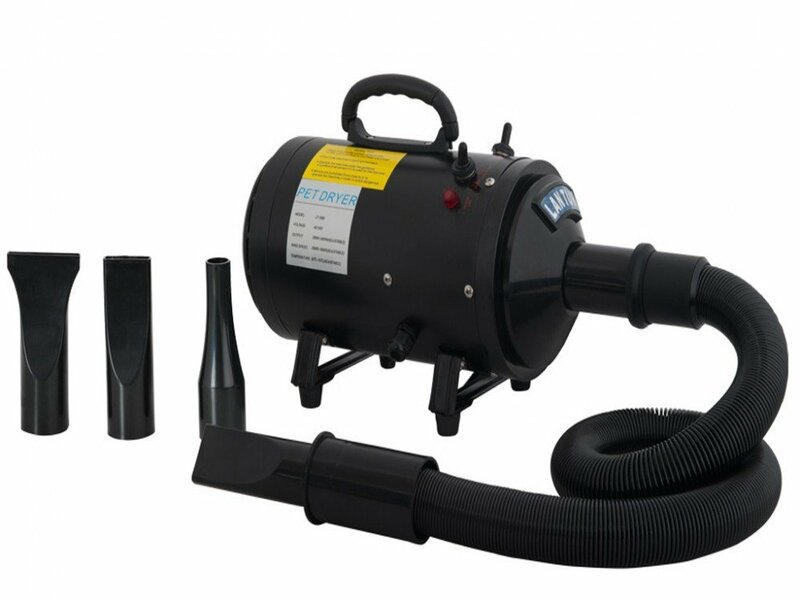 These usually have a fairly high velocity and work in a similar way to a leaf-blower. While it’s a good idea to get a dryer, money-wise, it is an investment so be sure to give it some serious thought before you just ‘blow’ your money. You’ll benefit purchasing your own dryer if you have more than one dog, if the amount of cash you spend at a parlor exceeds the price of a dryer, and if money isn’t an issue. The Go Pet Club Grooming Hair Dryer is perfect for home use. It’s not as powerful as some of the models the professional groomers use, but if you’re using it to blow out two, three or even four pets at home, then it is more than sufficient. The hair dryer has two adjustable temperature controls and two adjustable speeds. It also has low noise technology which is a huge plus. We found our dogs were terrified of the high velocity dryers at the parlor, hence the decision to groom them at home. The dryer has a reinforced flexible hose, to get everywhere on your pet and the unit itself is puncture resistant. There are four nozzle types, making the Go Pet very versatile. There you have it! The very best choice of brushes for Huskies, as well as deshedding treatments and a good option for a dryer. Let us know if you use any of the suggested products. Which one? Are you happy? Perhaps you use something completely different to get your Husky looking show-ready? Let us know if you have a personal favorite best brush for a husky in the comments below. We’d love to hear from you.